The radio will ask for a Honda stereo code when it is removed from the car as well as when the car battery is disconnected accidentally or when performing a maintenance procedure. 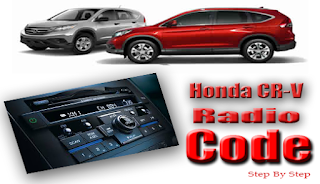 In simple word, if your Honda car radio loses power you will need to use a radio code to unlock it. >>> Helpful TIP : How To Change Your Car Battery Without Losing Your Radio Code. If you know the code then all you have to do is to enter it to the radio. You can check this Honda radio code entry instructions for help. If you don’t know the code just, you can locate it in your car paper, user’s manual or on a small ID card. It can also be located on a sticker on the glove box, or maybe it is noted right on the radio unit! This is not a secure place to have the code as the thief can have access to the code, but If you bought your Honda car as a second hand, you might need to check on it or the manual since there is a space that where the previous owner may have noted the Honda stereo code. If you see a number that starts with MIC, M46 or others starting with a letter, please note that this is not the radio code, so you will have to look somewhere else. If you can’t still find the code don’t worry, it is possible to generate Honda radio codes for free from the unit serial number. In the new vehicle models, Honda provides a very easy way to get the radio serial number without pulling it out from the dash. - Turn the ignition switch on, where the radio unit will display the CODE word. - Shut down the radio, and then hold down preset key number 1 and key number 6, while pressing the power button once. For 2003 - 2007 Honda Accord Navigation System, press and hold the top of the SEEK/SKIP and CH/DISC buttons. For older Honda car models and especially for the 2000 Honda radio codes, you will need to remove the radio unit and to retrieve the serial from the sticker. Removing the radio improperly will damage the stereo unit as well as the dash, so make sure you remove it properly. Check this Honda radio removal guide to remove the radio from the dash effectively. Once the radio is removed, locate the sticker on the top side of the radio casing. Option 1: You can Call dealers and give the radio serial number so that they will calculate the code for you! Some may help you even if you didn’t buy a car from them, but they will probably ask you to provide VIN, car model, make and proof of ownership. Keep in mind this is a courtesy service, and they are not obliged to provide it. Option 2: Another code retrieval solution is to get the code for FREE using a Honda radio code calculator software that can be downloaded from the internet. A Honda radio code generator is capable of unlocking any Honda stereo code for free. Just download and run The Software on your windows PC or Mac, enter the radio serial number and click the calculate button. instantly, your radio code will be shown in the screen. You will need to fill the online form and have all the information at hand and have to request Honda radio unlock code during working hours Monday to Friday 6 am to 11 pm CDT, and on Saturdays 6 AM to 8:30 PM, and on Sunday, 6 Am to 11 pm CDT. Now after generating your stereo code, you are at the last step. Just follow the exact code entry instructions, these may vary from honda CRV code to honda accord or any other model, but will be easy more often. Turn your vehicle ignition switch, enter the 4 or 5 digits stereo code and your radio should be back on. You can always refer to the honda code entry guide for more details. If you are not able to enter the code and the stereo says ERROR, then you must disconnect the black negative under the battery cable for at least 3 minutes to reset the system and get rid of the Honda radio code error. If you entered the wrong code too many times, you would be locked up. In that case you will need to wait for a longer time until you get Honda radio code lookup. When inputting the code, ensure that the vehicle is in the auxiliary position, not the start or run position. The procedure varies from one vehicle to another so make sure you locate the correct one. Be careful when using resources that promise to generate radio codes as some will damage your radio and you will have to look for Honda radio replacement. As you can see retrieving Honda car radio is pretty easy, and you have many options at hand. You can drive at car dealer if your vehicle has a Honda navigation system and they will give you Honda Navi code, but if not you can just access the code for free online, saving yourself from all the hassle. Don't hesitate to put your comments below and I will help as soon as i'm available. Please also like, share and sign up for the newsletter to stay updated with the latest Honda car technology. hello latest owner lost my honda civic audio system code .i am new owner and ido not know how i can find this code . could you please help me? my car honda N One 2015 model with Gathers VFM-152VFI Navigation system requiring password to work please help me to unlock my device. Needing a code to unlock my stereo. Hello. I just bought a 2002 Honda CRV for my son, and we are experiencing the same problem of no code for the stereo. Hi can you help me to find my code.my Honda 2002 the vin #Is 1HGCG66852A002284 serial number is 21034257 please help . Hi. I need help with my code on 2007 Honda CR-V, audio system ser#17212664. TNX !!! Can you help me about my honda jazz radio code please? hi, Any one out there know about honda radio code As i took the battery off , and now put new battery and the radio code is gone. Hello! Can you help please! Здравейте!Можете ли да ми помогнете,моля !